This page explains how to edit maps. This is an advanced guide for modders. A map is the layout of the terrain (like water, cliffs, and land), terrain features (like bushes), buildings, paths, and triggers for a particular area. When you reach the edge of an area or enter a building, and the screen fades to black during the transition, you're moving between maps. Back Terrain, water, and basic features (like permanent paths). Buildings Placeholders for buildings (like the farmhouse). Any tiles placed on this layer will act like a wall unless the tile property has a "Passable" "T". Paths Flooring, paths, grass, and debris (like stones, weeds, and stumps from the 'paths' tilesheet) which can be removed by the player. Front Objects that are drawn on top of things behind them, like most trees. These objects would also be drawn on top of the player. 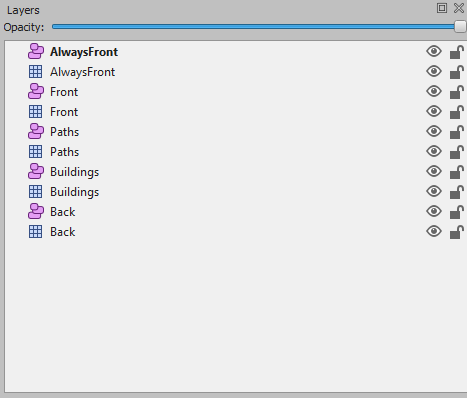 AlwaysFront Objects that are always drawn on top of other layers. This is typically used for foreground effects like foliage cover. Each layer consists of many tiles, which are 16×16 pixel squares placed in a grid to form the visible map. Each tile can have properties (e.g. passable / blocked), special logic (e.g. an action to perform when the player steps on them), and a picture to show. The picture is represented by a sprite index (or tile index), which is its position in an associated spritesheet (see next). Each map has one or more spritesheets (also known as tilesheets when talking about mods), which contains the available tiles and images that are put together to form the visible map. There are two main ways to edit a map. See instructions below for map changes. Install the latest version of Tiled. Once installed, at the top left, go to Edit > Preferences > Plugins and enable the tbin.dll plugin. View > Snap to Grid ✓ enabled This is required to convert objects back into the game's format. Highlight Current Layer ✓ enabled This makes it more clear which tile you're editing. See Modding:Editing XNB files for help unpacking & packing the map files. Important note: When making custom maps, always start with a vanilla map and edit. Do not try to create a new map in Tiled. You can add a new map and location to the game. Your map has to be build in a certain pattern; look at the maps in the Content/Maps directory for an example on how a map has to be built. You can create the map in Tiled, but you need SMAPI to add it to the game. You can add custom sprites, tiles, or images to a map. Be sure to prefix custom tilesheet IDs with z, to avoid shifting the vanilla tilesheet indexes and potentially causing graphical corruption. // Get an instance of the in-game location you want to patch. For the farm, use Game1.getFarm() instead. sheetSize: new xTile.Dimensions.Size(32, 64), // the tile size of your tilesheet image. To change tiles using the new tilesheet, see #Tiles below. Create your spritesheet and place it in the same folder as your tbin. This should be a PNG image with images divided into 16x16 tiles (see Modding:Editing XNB files#Intro for examples). Open the map in Tiled. In the Tilesets pane, click the button. Give it a descriptive name (like 'cute bugs') and choose the image source. Keep the default settings and click OK. In the Layers pane, click the layer you want to edit. In the Tilesets pane, click the tab for your custom spritesheet. In the Tilesets pane, click one tile to select it. To choose multiple, click and drag the cursor. Move the cursor to the map, and you'll see an overlay with the tiles you selected. Click the map to place those tiles on the selected layer. Each map can have multiple map properties, which define attributes and behaviour associated with the map like lighting, music, warp points, etc. Each property has a name (which defines the type of property) and value (which configures the property). See #Known properties below. Click Map on the toolbar and choose Map Properties. View and edit properties using the GUI. Tile properties are set on individual map tiles. They can change game behaviour (like whether the player can cross them), or perform actions when the player steps on or clicks the tile. Each property has a name and value. In Tiled these are represented by two types: object properties only apply to the selected tile, while tile properties apply to every instance of that tile. In general you'll always set object properties, so we'll only cover those. Select the object layer in the Layers pane. Choose the select object tool in the toolbar. The object properties will be shown in the Properties pane. Change a value: click the value field and enter the new value. Change a name: select the property and click the icon. Add a property: click the icon, enter the property name, make sure the selected type is "string", and click OK. There should be one object layer for each tile layer. 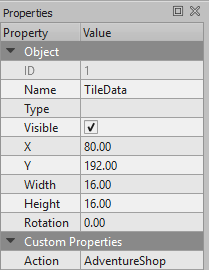 If the object layer is missing, create one with the same name as the right tile layer. Choose the insert rectangle tool from the toolbar. Click and drag the rectangle over the tile you want to edit . Make sure it snaps to the tile grid (see #Using Tiled), and only one tile is selected. See previous for how to edit its properties. You can edit the tiles for an existing map. You can animate tiles to create effects like Gil in his rocking chair (see example at right). Click the edit button (wrench icon) for the tilesheet in the Tilesets pane. Select the tile you want to animate in the new view. Click Tileset > Tile Animation Editor in the toolbar to show that window. In the new window, drag tiles from the tilesheet into the box on the left to create a frame (one image in the sequence). When you're done, close the pane. The animation is now part of that tile. Every instance of that tile on the map will now have the same animation. (valid in indoor locations and locations that ignore outdoor lighting) Sets the RGB colour that is subtracted from white (255,255,255) in order to create the ambient light. Example: AmbientLight 95 95 95 for a normal indoor daytime lighting. (valid in any location) Sets tiles to appear between 6AM to 7PM. Anytime before 7pm, this finds the tile at position (<x>, <y>) on the map layer matching <layerName>, changes its tilesheet index to the specified <tilesheetIndex>, and adds a glow to simulate daylight. The glow will only be added if the location is indoors and the <tilesheetIndex> is 256, 288, 405, 469, or 1224. The parameters can be repeated to affect multiple tiles. Example: DayTiles Front 3 1 256 Front 3 2 288. (valid in any location) Adds a door. The <x> <y> fields are the tile coordinates, <sheetID> is the name of the sheet containing the door sprite, and <tileID> is the tile index in the spritesheet. Winter_Objects T² Whether to spawn seasonal objects on spawnable tiles based on the data in Data\Locations.xnb. Any other value will crash the game. Example: Light 3 8 4 6 8 4 11 8 4 3 2 5 10 2 5 6 19 5 5 15 5 5 11 5 11 12 5 (Adventurer's Guild). (valid in any location) Sets the music that plays when the player enters, where <name> is the cue name in the audio files. (valid in any location) Sets the music that plays when the player enters, where <name> is the cue name in the audio files, music will only play if the time is between <int start> (inclusive) and <int end> (exclusive). Example: Music 800 1200 MarlonsTheme. (valid in any location) Changes the tile after 7pm. Outside, it works along DayTiles: set a DayTiles tile for the map to load between 6am to 7pm, then a NightTiles to load between 7pm to the end of the day. It is mostly used for lamps in the game. (valid in any location) Sets whether the location is outdoors. (valid in any location) The location is treated as outdoors for the purposes of spawning debris and similar mechanics. Trees [<int x> <int y> <int type>]+ Adds trees to the map. The <x> <y> fields are the tile coordinates, and <type> is the tree type (1: oak, 2: maple, 3: pine, 6: palm, 7: mushroom tree). Example: Trees 17 18 2 20 31 2. (valid in any location) ? (valid in any location) Forces the viewport to stay centered on the player. (valid in any location) Sets the tiles which warp the player to another map (e.g. doors). The <fromX> <fromY> fields are the tile coordinates that initiate the warp, and <toArea> <toX> <toY> are the name of the in-game location to warp to and the tile coordinates within it. Example: 6 20 Mountain 76 9. The following properties are used but apparently have no effect: Arch, Debris, and Fish. ¹ Map properties are handled in GameLocation::resetForPlayerEntry and GameLocation::loadObjects. ² The T value (short for true) is conventional, but any non-empty value will work too. Back Bed T² If the player stands on this tile, they're considered in bed for the purposes of stamina regen (in multiplayer) and pass-out logic. Back Diggable T² Marks the tile as diggable with the hoe and enables planting crops. Back NoFishing T² Prevents the player from casting the line onto this tile when fishing. Back NoFurniture T² Prevents the player from placing furniture on this tile. NoSpawn True Combines NoSpawn Grass and NoSpawn Tree. Back NoSpawn Grass Prevents debris (e.g. weeds or stones) from spawning on this tile. Back NoSpawn Tree Prevents trees from spawning on this tile. Prevents the player from planting trees on this tile, except on the farm. If a tree is already on this tile, prevents it from growing. Back NPCBarrier T² Prevents NPCs from crossing this tile. Back Passable T² Lets players walk or place objects on this tile, even if they'd normally be blocked by a building tile or different property. Different from Buildings Passable T below. Back Type <str type> Sets the tile type for various game logic (e.g. step sounds or planting crops), where <type> is one of Dirt, Stone, Grass, or Wood. Back Water T² Marks the tile as a water tile for various game logic (e.g. items splash into it, can refill watering can from it, can't walk on it, etc). Back WaterSource T² Lets the player refill the watering can from this tile. Buildings Passable T² When placed on a water tile, the game no longer considers it open water (e.g. if it's a bridge). Different from Back Passable T above. Paths Order <I> To place on index 29 and 30 of the Paths tilsheet. 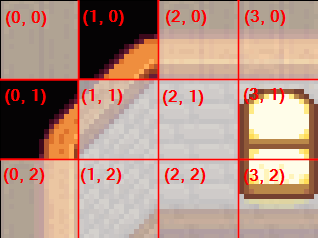 Set the order the cabins will spawn at the creation of a Multiplayer save. Back TouchAction ChangeIntoSwimsuit Changes the player into their swimsuit and disables running. Back TouchAction ChangeOutOfSwimsuit Changes the player into their regular clothes and enables running. Back TouchAction Door <string npc> If the player doesn't have 2+ friendship hearts with the villager named by the <npc> field: stops the player, marks the tile as impassible, and displays a door-locked message. Back TouchAction Emote <string npc> <int emoteID> Finds the NPC whose name matches the <npc> field, and causes them to show the given <emoteID> above their head (4: empty can, 8: question mark, 12: angry, 16: exclamation, 20: heart, 24: sleep, 28: sad, 32: happy, 36: x, 40: pause, 52: videogame, 56: music note, 60: blush). Back TouchAction FacingDirection <string npc> <int direction> Finds the NPC whose name matches the <npc> field, and make them face the given direction (0: up, 1: right, 2: down, 3: left). Back TouchAction MagicWarp <string area> <int x> <int y> [string prerequisite] Warps the player to the <x> <y> tile coordinates in the given <area> with a magic sound and effects. If the [prerequisite] field is specified, only occurs if that flag is set via Game1.player.mailReceived. Back TouchAction PoolEntrance Switches the player between swimming and walking mode. Back TouchAction Sleep Ends the day if the player confirms. Buildings Action AdventureShop Shows the Adventurer's Guild shop screen. Buildings Action Arcade_Prairie Shows the Journey of the Prairie King arcade game. Buildings Action Arcade_Minecart Shows the Junimo Kart arcade game. Buildings Action BuyBackpack Shows a menu which lets the player upgrade their backpack if an upgrade is available. Buildings Action Billboard Shows the calendar menu. Buildings Action BuyQiCoins Shows a dialogue which lets the player buy 100 Casino club coins. Buildings Action ColaMachine Offers to let the player buy a Joja cola. Action Blackjack Shows the casino blackjack minigame. Action FarmerFile Shows a dialogue with play stats (steps taken, gifts given, dirt hoed, etc). Buildings Action ClubSeller Shows a dialogue which lets the player buy a Statue of Endless Fortune for one million gold. Buildings Action ClubShop Shows the casino shop menu. Buildings Action ClubSlots Shows the casino slots minigame. Buildings Action Dialogue <text> Shows a generic dialogue box with the given text. See dialogue format. Example: Action Dialogue Hi there @! Buildings Action DivorceBook Shows divorce options for the player's current marriage status (as if they clicked the divorce book). Buildings Action JojaShop Shows the Joja shopping screen. Buildings Action Jukebox Shows the jukebox menu to choose the ambient music. Buildings Action kitchen Shows the cooking menu. Buildings Action Letter <string text> Shows the letter menu on-screen with the given text, with the syntax used by Data\mail.xnb. Buildings Action LockedDoorWarp [<int toX> <int toY> <string toArea> <int openTime> <int closeTime>] Creates an activation warp normally used on doors with a time window for when it can be used. Note that you must use 24-hour times, i.e. 2000 for 8pm. Buildings Action Mailbox Shows the next letter from the player's mailbox (if any). Buildings Action Material Shows a summary of the player's stockpiled wood and stone. Buildings Action Message <string messageKey> Loads a message with the given key from the Content\Strings\StringsFromMaps.xnb file and displays it in a dialogue box. Buildings Action MessageOnce <int eventID> <string message> If the player hasn't seen the event with ID <eventID>, marks that event seen and displays the given message text in a dialogue box. This does not parse dialogue format. Buildings Action MineSign <string message> Shows a mini-dialogue box with the given raw message text. This does not parse dialogue format. Buildings Action MinecartTransport Shows the minecart destination menu (or a message if not unlocked). Buildings Action MineElevator Shows the mine elevator menu (to warp to a mine level) if the player has reached mine level 5+, else a mine elevator not working message. Buildings Action NextMineLevel Warps the player to the next mine level (or level 1 if they're not in the mine). Buildings Action Notes <int noteID> If the player has found the specified lost book, displays its museum note text and marks it read. Buildings Action NPCMessage <str name> "<str dialogueKey>" If the named NPC is within 14 tiles of the player, reads dialogue with the given key from the string files and displays a dialogue box. See dialogue format. Example: Action NPCMessage Abigail "Strings\\StringsFromCSFiles:Event.cs.1022"
Buildings Action playSound <str cueName> Play the sound or music with the given name. Buildings Action QiCoins Shows a dialogue which lets the player buy 10 Casino club coins if they have none, else shows how many they have. Buildings Action Warp <int x> <int y> <str area> Warps the player to the <x> <y> tile coordinate in the <area> game location. Buildings Action WarpCommunityCenter Warps the player to the inside of the Community Center if they have access (else show an "it's locked" message). Buildings Action WarpGreenhouse Warps the player to the inside of their greenhouse if they've unlocked it, else shows a message about the greenhouse ruins. Buildings Action WizardShrine Shows the character customisation menu normally available from the Wizard's tower. ¹ Tile properties are handled throughout the codebase using GameLocation::doesTileHaveProperty. Actions and touch actions are handled by GameLocation::performAction and GameLocation::performTouchAction respectively. Emote IDs are listed as Character constants. The farm's Paths layer must have at least one tile with index 22 (grass spawn). This is used to initialise the grass code when the save is loaded, even if no grass is spawned. The two bed tiles where the player can walk must have two properties: Bed T (used to decide if the player is in bed) and TouchAction Sleep. Deleting or changing the wallpapers and floors will cause a game crash. If you add or resize any tilesheet, you must also edit Maps/FarmHouse1_marriage and Maps/FarmHouse2_marriage to have the same changes (even if you don't make any other changes to the farmhouse). This is needed because the tilesheet references and sizes are stored as part of the map file. Tiled does not handle "save as" correctly and messes up the path of the tilesheets properties. Current alternatve is to copy paste beforehand any maps you want to edit. This page was last modified on 15 April 2019, at 01:54.